The famous Las Vegas Hilton sign in the foreground, with the famous Hilton Casino in the background. 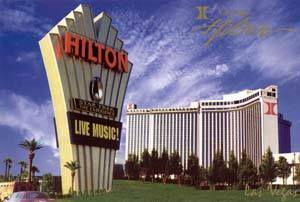 This Vegas casino icon has been a landmark for many decades. The King, Elvis Presley, helped make this casino famous. One of the best selling postcards we offer. Postcard size is 6 inches by 9 inches. Minimum order is 10, Free USA shipping on all quantities of 10-10,000. Orders processed within 48-hours and shipped First Class mail. Retail price per postcard is $2.50.